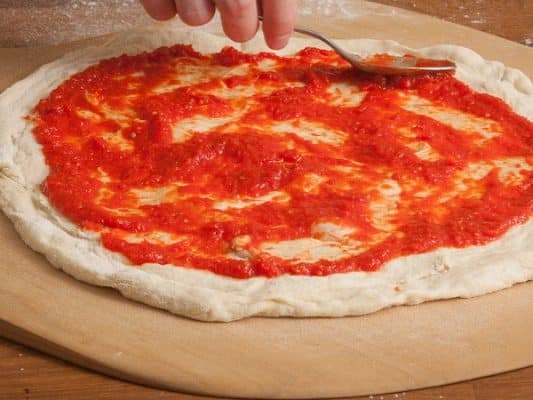 This tomato sauce is the perfect partner for our Dominos pizza dough copycat recipe. Super easy to prepare ready for when you want to make your pizza, and it works as a great starting point for a variety of toppings. Your road to making the perfect pizza starts here! In a small saucepan combine the tinned tomatoes and tomato puree and then heat over a medium heat. Bring to simmer then mix in all other ingredients. Keep simmering for 25-30 mins whilst occasionally stirring. After 30 minutes pour the sauce into a pot or container then allow to cool. Allow to cool on the kitchen side and then move to the fridge so it’s ready to go when you make your pizza. Need a perfect pizza dough recipe to cook along with this awesome tomato sauce? Check out our Dominos Pizza Dough Copycat Recipe.